Graduation is a memorable moment in the lives of young women and men and such an occasion calls for gifts that will be remembered and treasured for a long time too. If you haven't yet selected a gift for your favorite graduate, then consider getting a travel jewelry box. Travel jewelry boxes and cases provide storage and protection for your jewelry and accessories while traveling, whether it is for business or pleasure, and are sure to be appreciated by your gift recipient. To help you get started in selecting the jewelry box that would be just right for your graduate, let's take a look at a few of the most popular styles in this field. 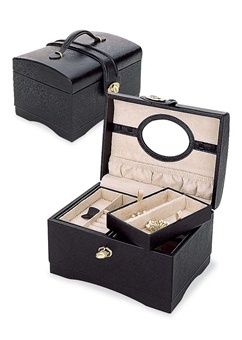 Reed and Barton makes a black travel jewelry box with a convenient carry handle. The box is handsomely crafted with black faux leather accented with raised stitched designs on the strap closure and handle. The case opens to reveal two side by side trays, an additional hidden folding tray that can be used as a traveling piece and spacious wells. 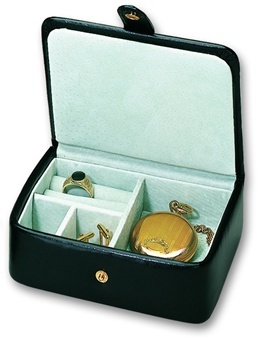 The lid includes a leather-framed mirror and pendant hooks with pouch, and the box accommodates rings, earrings, pendants and larger pieces. Priced at $80 but available on sale at $59.95, it is an exceptional value and sure to be appreciated by a fortunate graduate. If your graduate is a man then you should take a look at the leather accessories box manufactured by Budd Leather. 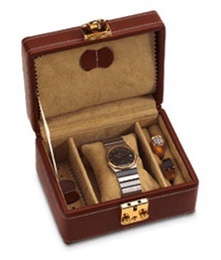 This men's box holds rings, cufflinks, studs and even a wrist watch or pocket watch. The handsome box fits neatly into a drawer and lists for $60, with a sale price of $38.95. You can also select a larger jewelry box if your receipient has an extensive collection that she likes to carry with her while traveling. RaGar makes a European black leather box that is truly a jewelry collector's dream. It is made of genuine leather in a French basket weave design accented with smooth trim. 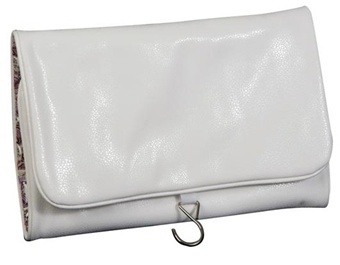 This medium size case features necklace holders and shirred pocket, ring bars, watch pillows, gliding drawers, lock, fold-down jewelry tray, mirror and divided jewelry storage. If your graduate is serious about her jewelry collection, then she will surely fall in love with this travel jewelry box. The box measures 9 x 6 x 6 and lists for $155, with a sale price of $129.95. Suppose your graduate is a frequent traveler and you want to provide a very practical way for her to use her jewelry while traveling, then the hanging jewelry organizer and travel case by Mele could be a perfect gift. With a convenient hook for hands-free access this jewelry organizer provides storage and stow-ability not only for jewelry but for makeup and other accessories as well. With four tiers it provides ample space for all her necessities. With a list price of $45 and a sale price of $34.95, this organizer will provide value far in excess of its modest price. I'll finish with a small watch and jewelry travel box. This leather watch box and jewelry travel box for men is both handsome and useful. With storage for accessories and rings, plus a removable watch pillow, this small watch box provides storage on the go and careful storage of a valuable watch at home. If your graduate prizes his watch, then this could be the perfect selection. It lists at $90, and you can get it on sale for $72.95. These are but some of the travel jewelry boxes that are currently available. If you take some time to look at the complete selection online you are sure to find a graduation gift that will be treasured for many years to come. Graduation is a memorable moment for a high school graduate and for a college graduate, and your gift to a graduate should be equally as memorable. If you are not sure what the gift should be, then consider getting a wooden jewelry box. Wooden jewelry boxes are both handsome and practical, and come in a variety of styles for men and women. Most people will probably think that a jewelry box is only a "ladies" item. While this is not really the case, as we shall see in a moment let's start with a look at what is available for your women graduates. 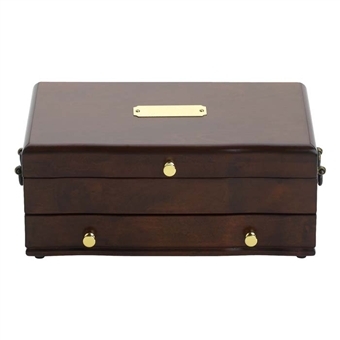 Wooden jewelry boxes come in a variety of hardwood finishes and the Duchess II jewelry chest by Reed and Barton comes with either a cherry or mahogany finish. Its lid has pendant hooks and an elastisized pouch. There's also a drawer for earrings; three well compartments and ring bars - all lined in velvet. The Ducess II can be personalized with an engraved solid brass nameplate attached to the lid. The list price for this box is $180 but you can get it at a reduced price of $129.95. Reed and Barton also makes a Princess jewelry box that would be perfect for your princess-turned-graduate. This handcrafted heirloom jewelry box is loaded with stunning details including a lid with pendant hooks, shirred pouch, lined earring drawer, ring rolls, plus bracelet and necklace storage. It's finishedin mahogany, has a Dior red lining, measures 11 x 7 x 4 1/2 inches, and lists for $140 but can be purchased at a reduced price of $94.95. Is your graduate "Man of the Year"? Then, Reed and Barton's Man of the Year wooden jewelry box is what you should give him. This handsome wooden dresser top men's jewelry valet features sleek styling and a mahogany finish. 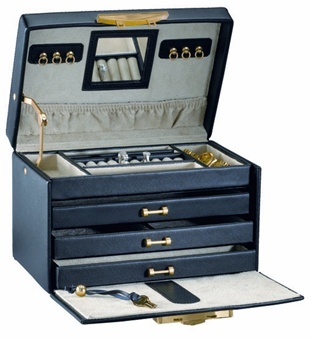 It has a rich nylon velvet lining and the lid opens to reveal a tie bar and a multi-compartment storage well with space for chains, rings, watches and cuff links. 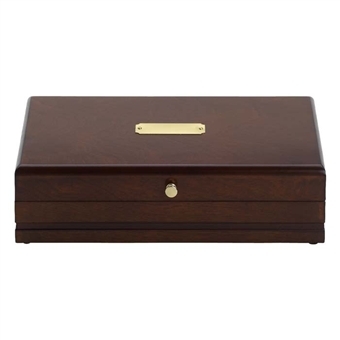 It has a solid-brass lid lid lift with a name plate that can be engraved with the initials or name of the graduate. With a list price of $120 and a reduced price of $89.95, it will make a distinctive and memorable gift for your graduating man. 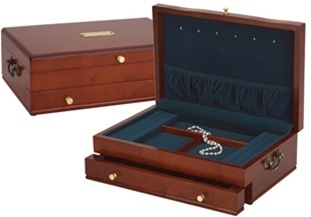 These are just a few of the possibilities in the category of wooden jewelry boxes, but it will give you an idea of how you can reward a young man or woman who has reached the important occasion of graduation.